"Indie Musician" Ahveekhy And Other Talented "Indie Musicians"
"Sound of Paradise" (founded by indie musician Ahveekhy) provides Music Entertainment for all types of occassions as well as Nursing and Retirement Homes. We play music genres ranging from Jazz, R&B, Reggae, Popular, Praise and Worship as well as originals. Our services include solo performances (guitar/vocals) duos (solo guitar/vocals and percussion) or a three (3) to five (5) piece band. Ahveekhy (Ah-vee-chai) Ben BinahYah the founder of “Sound of Paradise” was born in New York City in 1958, and lived in Queens, Brooklyn and finally Long Island, NY where he attended Junior and High School in Malverne, NY. He started learning guitar and voice under his father’s tutelage the late Dr Stanley E Lowe (BinahYah) at the age of 14 and did his first public performances at around 16 years old. He also was tutored extensively in theology under his father who had a doctorate of arts in biblical studies. Ahveekhy attended Ambassador College in Pasadena California and majored in Music Education. Ahveekhy moved from New York to Chicago in 1984, moved to Ghana in 1997 and returned to Pittsburgh, PA USA in 2007. During his stay in Africa he was able to refine his musical talent under the mentorship of Fianko Yirenchi a very talented and skilled indie musician (guitarist and bassist) who was founder of the jazz trio “No Dogs Allowed” in Nigeria and Ghana. Ahveekhy is a singer songwriter, guitarist, producer and founder of Deliverance Music Ministries. www.deliverance-music.org Ghana is where the song writing began for Ahveekhy. He has written and produced a variety of songs in the secular arena as well as Praise and Worship music. In 2008 and 2009 he produced the performance series Let’s Rise Again-ABABIO as a way of sharing some of his experiences in Ghana through music and dialogue. He has also produced 3 music albums: War No More (an acoustic album), “Ahveekhy Live: Let’s rise Again-ABABIO” and Songs Of Praise to Yahweh (Praise and Worship Album) His ten year stay in Ghana West Africa gives him a unique and broadened perspective of our plight as African Americans and the world in general. He is able to share this perspective in some of his music and many of his performances. With his spiritual family background he has been able to infuse his music with inspiring, uplifting and positive messages of deliverance from an increasingly evil world, and turn people’s eyes to the Creator and the promise of a new world to come. I am an Indie Musician, Solo Performing Artist, vocalist guitarist, and composer named Ahveekhy (Ah-vee-chi). In the Hebrew language my name means my father is life. Of course it is referring to my heavenly Father Yahweh. I just returned in 2007 from Ghana West Africa after living there with no return visits to the U.S. for 10 years. It was a life changing experience, and the most difficult and rewarding thing I've done in my life. "Songs Of Praise To Yahweh Volume 1", and the Song Trilogy "Yahshua's Prayer" As an Indie Musician I've had some memorable experiences in Ghana, met some wonderful people, and gained some tremendous insight, which I share in my live album from the performance series "Let's Rise Again-ABABIO". I was blessed to have some great performance experiences in Ghana. 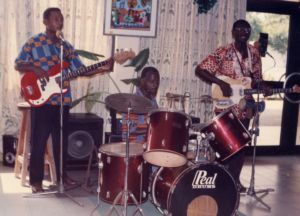 I then joined another group of musicians Featuring myself with guitarist/bassist Fianko Yirenchi a Ghanaian born and raised in Nigeria (who I learned a lot from and as a result advanced in my understanding of music) and Tommy was our drummer....Our drummer passed on (May his soul rest in peace)...we then acquired Napolean another fantastic Ghanaian drummer...who by the way played a special performance in Ethiopia as a young boy playing the cungas, when Asagyfo Dr Kwame Nkrumah (1st Prime minister of Ghana who led Ghana's drive for independence) took a group of musicians to perform for His Majesty Emperor Haile Salasse...(By the way he told me it's true that His Majesty did have lions in his courtyard as you enter...but he too passed on (May his soul also rest in perfect peace). I was honored to participate in Panafest 2003 and 2005 featured as a Indie Musician solo performing artist, performing songs I wrote. My songs were chosen as the theme song for Youth Day, both years that I participated. The theme song I wrote for Youth Day in 2003 is entitled African Shining Star, and in 2005 the song is entitled Let's Rise Again. I had the pleasure of also performing in Accra Ghana at the club named Jazztone (owned by Tone Matteson a jazz vocalist from California)where I was privileged to sing with a great bunch of musicians including, Victor Dey(a fantastic young Ghanaian Jazz pianist), Ray Allen (horn player extraordinaire), Gautier (Fantastic world class bassist from Togo) and Craig Haynes (Fantastic Drummer also son of legendary Roy Haynes) along with others. This was all made possible as the result of the recommendation of another of my dear friends recording artist producer George Edah. I also hope to feature another musician solo Performing/Recording Artist and Composer Scott Bertlee the founder and director of the popular Cape Coast, Ghana Band "The Might I Am". I was privileged to learn from Scott also a guitarist and vocalist who helped me expand and refine my Reggae music repetoire. Of course this would not be complete without mentioning Musician Composer Kwesi Quayson Bassist, Guitarist and Former Music Director of "Agora". I also hope to feature him in the near future. I hope will continue to enjoy the sharing of my experiences and continue to check this web site for new additions. We will also have opportunities for other Indie Musicians who want to contribute.